All companies must continuously innovate to remain competitive, but there is a significant difference between innovation and disruptive innovation. As an example, imagine innovations as apples growing on a global innovation apple tree. A good company might design novel ways of efficiently collecting apples that fall to the ground, which are easy to gather and are reasonably fresh. But a leading company will use a ladder to reach the freshest and best apples. While there is an additional effort required to climb up and get the best fruit, it is always worth it in the end. We provide this ladder to our clients, in the form of “The EDGE” programme – a high-impact, short-duration programme for managers and senior leaders that equips them to bring fresh, game-changing innovations and best practices into your firm. We will take your managers and senior leaders for a period of 2-5 days and actively expose them to highly innovative and entrepreneurial hubs, such as Singapore, London or Boston. During this brief rotation, they will engage with leaders of successful startups and innovative business executives through collaborative workshops. Throughout the programme, participants are supported by certified coaches who facilitate the workshops and help consolidate essential learning. “The EDGE” consists of a combination of carefully structured programme modules that holistically support the desired learning objectives. All modules within “The EDGE” programme are hands-on and experiential – participants are immersed in various collaborative settings, where they learn by working and creating in partnership with leading innovators, entrepreneurs and experts in respective fields. Through our modules, we craft learning environments where participants benefit from intensive exposure to new means of working and thinking – all while being actively exposed to the key methodologies, perspectives, and tribal knowledge of leaders in their fields. For additional details, click on the respective main modules in the list below. Summary: Exchange with key employees of market leaders and disruptive start-ups, taking place on inspirational premises of the respective companies. Description: Company visits take 2-3 hours and are connected to a topic that the particular company excels in (e.g. digitalization, agility, innovativeness, particular technology, people leadership etc.). Company visit starts with a short keynote speech by a senior manager/executive, followed by group discussion. Group discussion has several subtopics, each allocated to a separate table driven by 1-2 key employees from the visited company. Participants join a table (topic) that they find the most interesting and discuss the topic for the duration of the allocated timeslot (e.g. 30 min. ), then choose another table for the next timeslot. Company visit is concluded by group sharing of learnings and insights acquired. Example: High-potentials visited Alibaba in Hong-Kong and exchanged on the topic of agile tools, methods and workflows required to operate in dynamically developing markets. Summary: Intensive design thinking teamwork among participants with diverse cross-functional backgrounds, within specific subject matter and time guidelines, with facilitation provided by certified coaches. Description: Innovation Bootcamp is a module where participants from various backgrounds (designers, programmers, managers, entrepreneurs, innovators, etc.) collaborate intensively on a specifically defined, time-constrained project (e.g. 12 or 24 hours). Innovation Bootcamp typically begins with a general presentation of the subject matter and project-specific requirements. Participants then form teams and collaborate on innovative approaches to the stated problem, based on team-members’ interests and skills. The module is concluded with a series of demonstrations during which each group presents their results, including detailed reflection and debriefing by certified coaches. 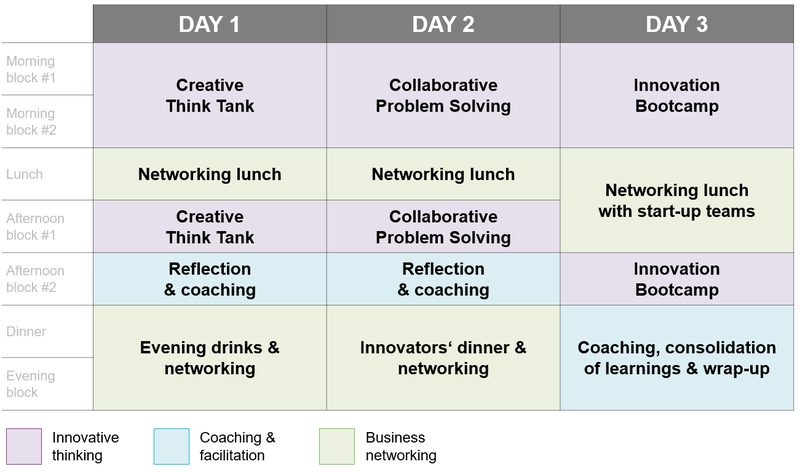 Innovation Bootcamps have wide-spread applications, ranging from product design and development, to project iteration and business planning sessions. These challenging events have proven particularly popular for their ability to stimulate entrepreneurial and innovative thinking. Example: Middle managers from the hi-po talent pool spent a full day in London working with leading mobile and tech entrepreneurs to develop a concept and business model for a knowledge-based crowdsourcing platform. Summary: Focused groupwork among participants and members of leading technological, public or social organizations, targeted on developing a solution to a current business challenge. Facilitated by certified coaches. Description: Within this module, LITS Global handpicks leading local organizations, each represented by 2-5 employees. The profile of contributing organizations corresponds with the specific requirements of each client and may include technology firms, local start-ups, NGOs, social enterprises, public institutions etc. Each partner organization provides a business challenge that they are currently facing and client-participants are divided among the partner groups, according to their areas of interest. During the following 3-4 hours, client-participants work with their partner organization’s team members to address the stated business challenge. The entire collaborative process is facilitated by certified coaches. Example: Senior executives collaborated with local community leaders in Bangkok, Thailand to identify a sustainable alternative to a public dumping ground that was polluting a low-income neighborhood. Summary: Facilitated discussions between participants and industry experts centered on future trends and innovations within the respective industry or market. Discussion outcomes and ideas are consolidated using various creative methods. Description: The initial component of the module involves actively facilitated discussions between participants and local leaders (start-ups, innovators, entrepreneurs, businessmen etc.) relative to trends, new technologies and business models, visionary outlooks, or other topics that interconnect business, environment and society. Participants are required to build upon their ideas, thoughts and knowledge and to adapt quickly to the framework presented by the certified facilitator. The exercise serves to stimulate participants‘ creativity and collaborative skills. Example: Programme participants along with technology experts and designers from Silicon Valley, spent a day consolidating their visions of how automobiles will change by the year 2050. Summary: Intensive exposure to the local market with special emphasis on consumer, cultural and socio-economic impact. Description: Through a series of visits and field trips, participants learn how to analyze the needs and limitations of the local market. A field trip may include visiting a local industry-relevant company and participating in a strategic workshop with top management on topics such as market trends or consumer preferences. Other possible itineraries include off-site meetings with prospective customers or immersive, out-of-comfort-zone experiences involving visits to remote rural areas. Example: Middle managers participated in a series of field trips in rural Madhya Pradesh, India, to increase their familiarity with the principles and realities of low-income banking and microfinance institutions. Summary: Exchange of business insights and best practices through impactful 20-minute presentations. Description: Participants meet with leading local businessmen, entrepreneurs and experts to exchange business insights through the unique format of empowering 20-minute TED presentations. Following the talks, the most interesting topics are selected by group consensus and delegated to teams for further discussion. Throughout the team review process, participants are supported by a certified facilitator. Example: A group of hi-po employees participated in a series of TED talks set in Singapore, with a focus on defining FMCG customer preferences and market drivers within Southeast Asia. Summary: Social and group events presented to support cultural understanding, break down biases and stimulate cultural awareness. Description: Understanding local traditions and customs is a critical component of foreign market analysis. The availability of culturally themed modules provides participants with the opportunity for direct insights, while allowing an opportunity to relax and network. Example: Culinary adventures, spiritual journeys, field trips, dance performances, etc. A multinational machinery company had struggled to efficiently bring innovations to market and keep up with the competition, despite attempting numerous approaches. They reviewed competitive innovations in the DACH markets (Germany, Austria and Switzerland) before determining that they needed to drive a culture of innovation through managers and senior managers. The inherent difficulty in pursuing this approach was that most managers and senior managers had well-established functional roles and had been in their positions for in excess of 8 years. A group of 24 managers and senior managers from DACH markets were identified and sent on a 3-day Learning Expedition in South Korea. Day 1: Creative Think Tank with business leaders from companies such as Samsung, LG Electronics and other innovative firms. Day 3: Innovation Bootcamp with multiple interactive workshops involving local start-ups and focused on how to effectively and efficiently bring new products to market. In addition, regular daily sessions and a closing evaluation with certified coaches helped ensure that participants were able to assimilate their key learnings and apply them to their professional roles in their home countries. 86% of participants consider the new insights and entrepreneurial approaches that they encountered during the programme to be valuable and highly relevant to their daily roles. 86% of participants confirmed that “innovating” is a much more tangible and comprehensible process for them and that the programme significantly enhanced this competency. 93% of participants report that the programme enabled them to create strong bonds with local experts, business leaders and other participants.